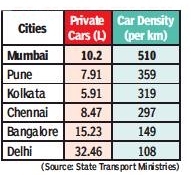 Pune follows Mumbai with 359 cars per km, compared with 319 in Kolkata, 297 in Chennai, 149 in Bangalore and 108 in Delhi, reveal statistics from state transport departments. In mid-2016, the car density in Mumbai was 430 cars per km, a figure that has gone up to 510 cars/km (road length of 2,000 km). This has taken the total number of registered private cars on city roads as of date to 10.2 lakh—around 28% of Mumbai’s total vehicular population of 36 lakh. RTO officials said maximum car registrations were in western suburbs which has over 5 lakh registered cars, followed by 3.3 lakh in the island city and 1.7 lakh private cars in the eastern suburbs. Officials said upmarket areas in eastern suburbs like Powai had the maximum registrations for high-end cars and SUVs in recent years. Chembur was the next big suburb on the eastern side to have car registrations in almost every middle class household. The Eastern Freeway is a preferred route for those in Chembur as it provides a high-speed connect to SoBo and saves over half an hour in commuting time. RTO records also showed that Colaba-Cuffe Parade had a huge vehicular population, including many commercial vehicles, compared with tony areas of Malabar Hill, Nepean Sea Road and Pedder Road. In the western suburbs, Andheri and Goregaon had several residential and commercial hubs where car population has swelled over the years. The next three car-congested western suburbs were Kandivli, Bandra and Borivli, with a large number of households going in for bigger cars that occupy more road space, an official said. A recent study by Mumbai Environmental Social Network, a think tank, showed that among private vehicles, 49% of road space is occupied by private cars—all types, including SUVs. This is a key reason for increasing traffic congestion, with average speed on Western Express highway dropping to 10 kmph during peak hours, and on LBS Marg to less than 8 kmph.